Hard work, enthusiasm and the fantastic contribution to public services made by apprentices across Tendring and North Essex was celebrated at a special event this morning. Each of the 33 apprentices attending – some of whom are long-serving staff at Tendring District Council (TDC) were awarded with certificates for their dedication towards achieving various qualifications. Certificates of Achievement were handed out to apprentices by Debianne Messenger, Work Based Learning Manager. Certificates of merit were also awarded to those who have “blazed a trail” and gone the extra mile in their apprenticeships; certificates were given out by Cllr Carlo Gugliemi, TDC Portfolio Holder for Finance and Corporate Resources and Deputy Leader. Among those recognised was Colchester Borough Council’s Benefits and Council Tax Apprentices, who were presented with the coveted Assessors Award for commitment and achievements. TDC Chief Executive Ian Davidson added his thanks to the Career Track team for the work that they do. “This is absolutely key in terms of the way we can grow our future with new staff, and in terms of capacity of what we can do as a council, 13% of TDC staff were previously on our apprenticeship programme” he said. 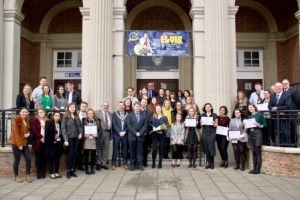 Some apprentices from Colchester Borough and Maldon District Councils, and other small and large organisations in the District who are part of the wider Career Track scheme, were also recognised at the event.